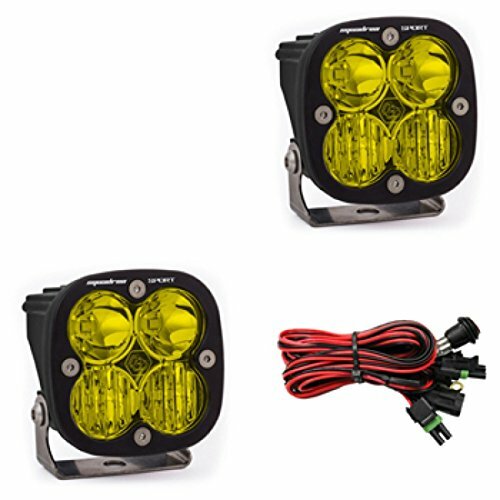 Baja Designs Squadron Sport Pair UTV LED Light Driving Combo Amber Pattern by Baja Designs at Chosen Hubs. MPN: 557813. Hurry! Limited time offer. Offer valid only while supplies last. Two is always better than one, right? We think so, which is why we're offering a pair of Squadron Sport LED auxiliary lights with wiring harness. Two is always better than one, right? We think so, which is why we're offering a pair of Squadron Sport LED auxiliary lights with wiring harness. Although similar in aesthetics to the Squadron Pro, the application for the Sport varies. The Squadron Sport utilizes 4 Cree XP-G2 LEDs producing an impressive 1,800 lumens at 20 watts per light, making it ideal for near field, side/backup and scene lighting application. An industry first 30 Day Satisfaction Guarantee & Limited Lifetime Warranty is included for the ultimate in purchase protection.